Prairie Falcons may not get as much press time as Peregrine Falcons do but I sure find them fascinating and amazing birds. I've struggled for over two years trying to get a decent photograph of a Prairie Falcon but it seemed that they were always too far away or flew in so fast that I didn't realize they were there until they were out of range. On November 11th I was fortunate to see a Peregrine falcon on the shoulder of a road with prey, the light was horrible but I hoped to get a photo or two of the Peregrine with its prey and I was getting ready to start clicking the shutter button when movement from just north of the Peregrine caught my eye. During a very brief skirmish I could see that the other bird that had flown in was a Prairie Falcon, the entire conflict lasted perhaps less than 2 seconds and, to my surprise it was the Peregrine that flew away abandoning its it prey to the Prairie Falcon. 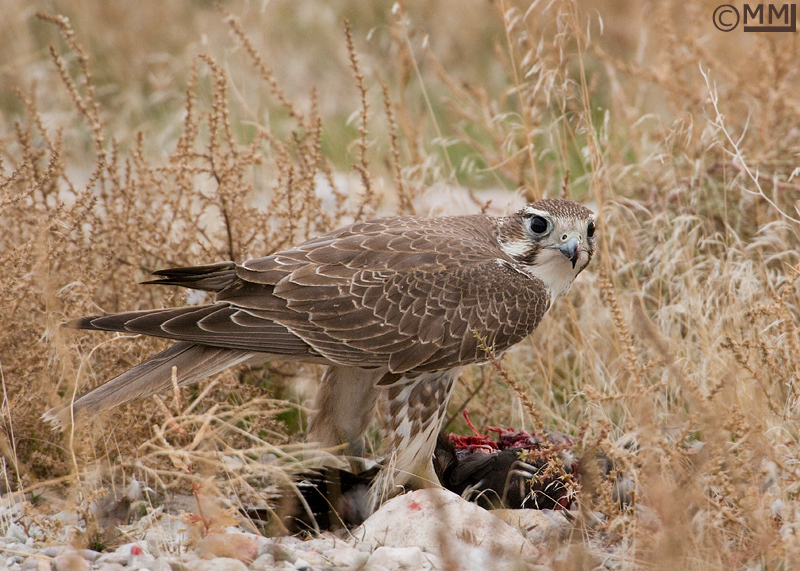 The Prairie Falcon hopped and dragged the prey just off the shoulder of the road into dried vegetation so that the bird and the prey were slightly hidden. The prey turned out to be a Ruddy Duck and the falcon tore right into it. Low light and vegetation can be the bane of a photographer's endeavors but I continued to photograph the bird. I was excited to have captured images of what had been a nemesis bird until that day. After going home and uploading my images to view on my screen I realized that I had photographed a first year Prairie Falcon and wondered if that was why it allowed a closer (and longer) approach than I've ever been able to achieve with one of the larger falcons before. I'm not one who believes bird photography is all about skills and that often some luck is involved so I just hoped I'd get more chances with the Prairie Falcon in better light and more out in the open. My luck has come in handy on several different occasions since I first photographed the young falcon and I've gotten good light and better settings too. Prairie Falcons are year round residents of Utah, ground squirrels are their key prey but during the winter when the squirrels are underground they will take small birds such as Western Meadowlarks and Horned Larks which Utah has in abundance throughout the year. On November 17th I was able to photograph another (or perhaps the same bird) Prairie Falcon as it hunted and rested along the same road and in the last location I was close enough to the bird to be able to photograph the bird as it perched on a rock with the Great Salt Lake in the background, in decent light as it scanned the area fin search of prey. I couldn't jump up and down for joy then out of fear of scaring the falcon away but I can tell you that I was doing just that inside myself. I was paying so much attention to the falcon that I didn't hear a vehicle approaching, I wish that I had so that I could have had time to back up my zoom some to capture images of the Prairie Falcon as it flew away, but I did manage to get a few lift off shots without clipping the wings in the frame. Again, it was a first year bird, I could tell because the cere, bill and legs weren't a bright yellow. During this period of time I have spotted Prairie Falcons in the air frequently, at one point there were two and they seemed to be chasing each other in some kind of aerial dog fight. That was amusing to watch. 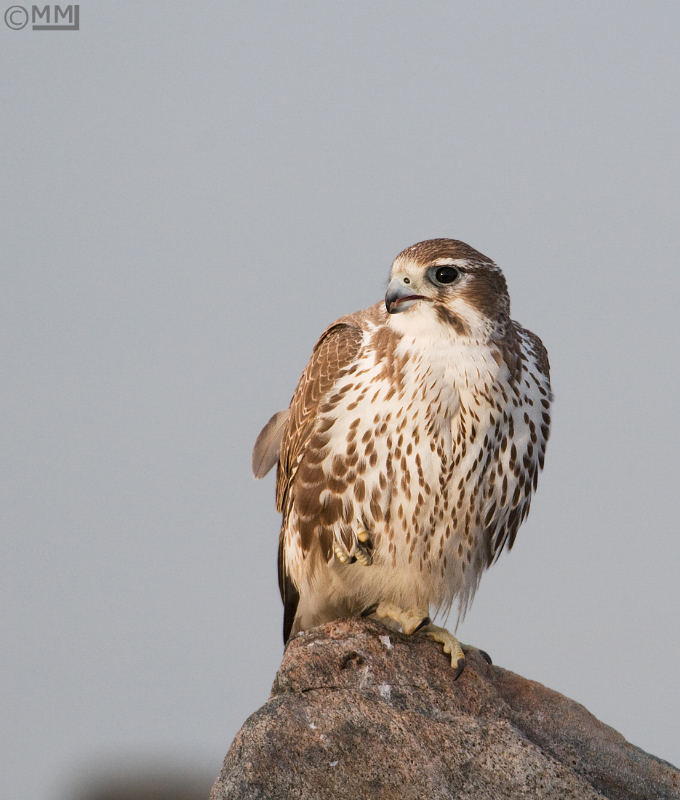 On December 6th I spotted a Prairie Falcon again on the same road, I wasn't able to get as close as the previous session but managed to obtain some nice photos of the falcon perched on a rock and as I looked at it through my view finder I could see that it was also a young bird. My most recent sighting of a Prairie Falcon was on December 8th; there it was in golden morning light perched on a dark rock with the lake in the background. I was only able to fire off about 20 shots of the falcon before it flew away, but I am very happy with the resulting images. Peregrine Falcons may get more press but I'll never turn down a single opportunity to see, observe and photograph the Prairie Falcons of Utah. I also know I'll be back out on that road again looking for them soon. 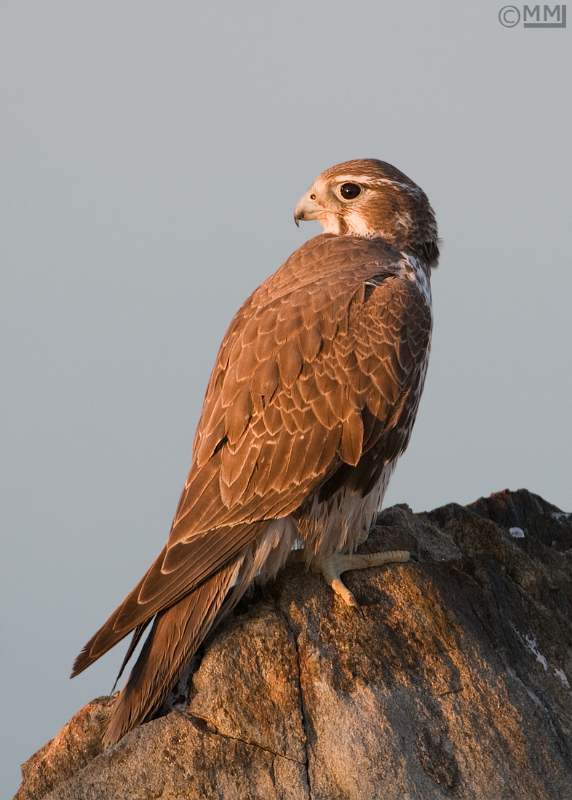 Thanks Dan, Prairie Falcons are beautiful birds! Looking forward to see your work as you explore different settings & techniques. Gorgeous Mia! 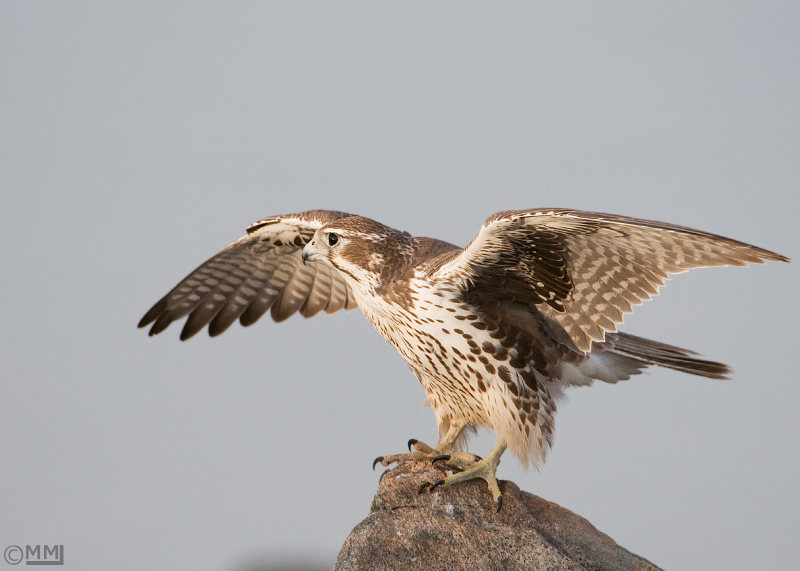 I can't imagine Prairie Falcon photography getting any better than that. Glad you finally broke the nemesis bird curse on that one. Really wonderful photos, and such fortunate and exciting encounters. You are right about luck playing a big role, being in the right place at the right time. But, your obvious skill shines through too! Great post Mia, super photos. Thanks for your comments Robert, Carol and Prairiebirder! 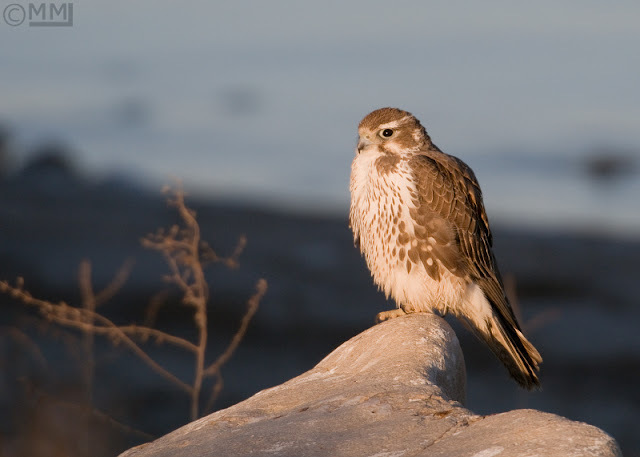 Mia, I am so glad that you featured the Prairie Falcon in this post as I have never seen one in person before. From viewing your outstanding images, I can see that they are stunning birds. All of your photographs are fantastic but the last one really took my breath away. How fortunate for you to be able to view these birds. Awesome! Fantastic images Mia! I'm glad you were able to have several encounters with these beauties. Julie, Prairie Falcons are stunning birds and I was very glad to have found some that were cooperative, especially the ones in good light! Thank you for your very kind words on my photography. Thanks Jeremy, I've had another encounter with Prairie Falcons but haven't been able to find time to edit the images. They are fascinating! Absolutely awesome photo of the Prairie Falcon, Mia. I have only had one opportunity to photograph one. It was atop a utility pole about two blocks from my house. It is interesting that this bird was your nemesis. I, too, have a nemesis. It is the Northern Harrier. I have seen quite frequently but it keeps eluding me. I hope that I can soon get my chance, like you did with those beautiful shots. Thank you again because all you people here are my windows to the avian world! Wow! Images of Prairie Falcons just do not get better than this. Great post! Thanks so much for commenting Bob, Aristarkhos and Chatterbirds. Bob, I'm sure you will get those Harrier images sooner than later. Just found this other site of yours ;) Excellent article and love the clarity of the whites on the falcon shots.